The earthquake in Nepal has led to cancellations of hotel bookings by many visitors who were planning a trip to Darjeeling at a time the peak tourist season is on. The region felt three distinct tremors on April 25, 26 and 27 and the aftershock of the quake is being felt by the tourism industry with around 30 per cent bookings being cancelled. Pradip Lama, secretary, Darjeeling Association of Travel Agents (DATA), today said: "Reports of the epicentre of a quake being somewhere close to Mirik have disturbed many travellers. That is one reason behind many cancellations. The other factor is that many groups from Gujarat and Maharastha usually come for the Nepal-Darjeeling-Sikkim tourism circuit. Nepal is out of question and many are jittery about going to Sikkim because of the 2011 earthquake." On September 18, 2011, Sikkim had recorded a 6.9 earthquake on the Richter scale that left more than 60 dead. "As of now, our estimate is that there has been about 30 per cent booking cancellation here. But in the case of big groups, those who book 25-30 rooms in bulk, the cancellation could be as high as 50 per cent in May," Lama said. Sources said Darjeeling had an occupancy rate of almost 100 per cent this tourism season. 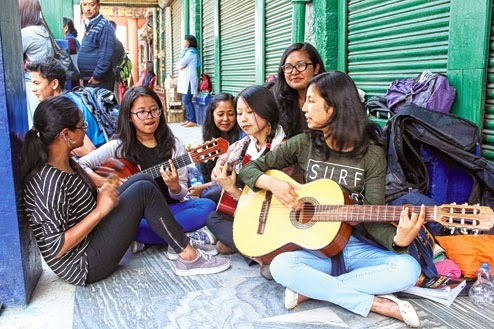 At any given time, Darjeeling can accommodate around 8,000 tourists, said Suresh Periwal, the managing director of Clubside Tours and Travel, one of the oldest travel agents in Darjeeling. May is supposed to be the peak tourist season in the hills. This season usually begins from mid-March and stretches till the first week of June. The next season starts from around the Durga Puja and goes on till December. The hills usually receive around 4 lakh visitors a year . Tashi Pencho, whose family runs hotel Little Tibet and Hotel Seven Seventeen in Darjeeling, said: "There have been 20-25 per cent cancellations so far. I am writing to all those who have bookings with us saying Darjeeling is absolutely safe and there has been no major damage after the earthquake." Little Tibet has 24 rooms while Hotel Seven Seventeen has 22 . "My hotels were supposed to be almost full today but they have only 60 per cent occupancy," said Pencho. Many hotels like Little Tibet have decided to provide new dates to those who have cancelled bookings. "We usually accept 20 per cent of the total tariff as advance to confirm bookings. In case of cancellation, we normally do not refund the amount. But this time, we are offering an option to the guests to book rooms for another time this year against the advance they have paid," Pencho said. Many hoteliers in Darjeeling are hopeful that the tourist season will start picking up in the next 10-15 days. "We hope that a positive message will go to the tourists that visiting Darjeeling is absolutely safe. We are keeping our fingers crossed and hoping that the tourist season would peak after May 15," said Pencho.